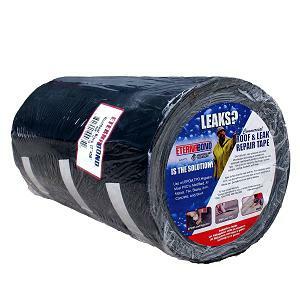 PRODUCT: EternaBond RoofSeal BLACK Waterproofing Repair Tape, 12 in. x 50 ft., Price/Roll. (Special order item, 3-5 day leadtime). RoofSeal is the best solution for leak repair or corrosion protection in tough environments and conditions, including land-fill and pond liners. Also excellent for Deck Ledger Flashing Self-Adhesive Membrane.